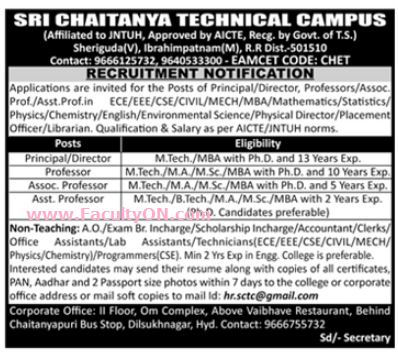 Sri Chaitanya Technical Campus, Ranga Reddy has advertised in the DECCAN CHRONICLE newspaper for the recruitment of Professor / Associate Professor / Assistant Professor / Principal / Director Plus Non-Faculty jobs vacancies. Interested and eligible job aspirants are requested to apply within 7 days from 21st June 2018. Check out further more details below. About College : Srichaitanya Technical Campus was established in the year 2009 at sheriguda,Ibrahimpatnam, Ranga Reddy(Dist),Telangana .It is affiliated to JNTUH,Hyderabad and approved by AICTE,New Delhi.Sponsored by Sri Venkata Sai Educational Society was set up in 2008 with Regd No. 1053/2008 by a group of highly qualified and well experienced philanthropists with a motto of serving the society through educational institutions. How to Apply: Interested and eligible candidates are requested to send their CV, all copies of certificates, PAN card, Aadhaar card, experience / relieving certificates and 02 recent colour PP size photos to the following college address or corporate office address or email address.